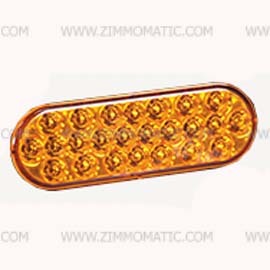 The 24 LED 4 inch round strobe light is the perfect light for construction or excavation vehicles required by law to be equipped with blinking lights. Not only do you have the choice of 6 different flash patterns with up to 198 flashes per minute, but if you buy this light, an entire assembly, light, grommet, and pigtail, comes with it, including directions to make installation super-easy. This strobe, 4 inch round amber, LED, holds 24 LEDs and flashes in 6 patterns. You can choose between several eye-catching, synchronized flashes or random flash patterns of your choice. Its heavy-duty outer shell protects it from knocks and bumps, keeping your lights intact even in the toughest workplace environments. 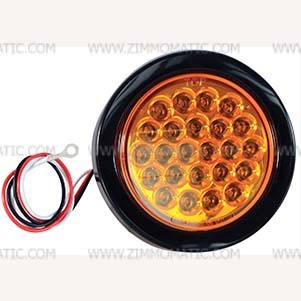 The 4 inch round strobe light comes with the necessary rubber grommet to mount it as well as the pigtail needed to splice it into the existing wiring on your truck or trailer. 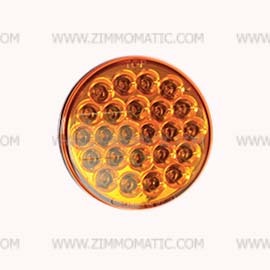 We also offer an oval amber strobe on our website, BPSL65AO.